This member of the Hyacinthaceae family was described by Robert Sweet in 1826. 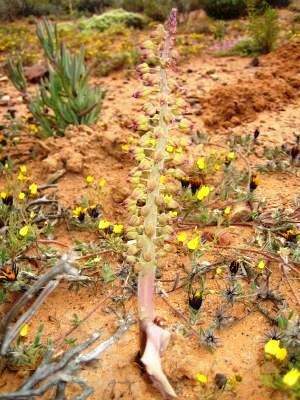 It is found in the Cape Province of South Africa, growing in a well drained soil with some water and lots of sun. The bulb will grow to four centimetres, the whole plant up to 25 centimetres. The flowers are from yellow over pink to blue. The genera name is in honour of the Swiss botanist Prof. Werner de Lachenal (Warnerus de la Chenal )1739-1800.